D4 GDI antibody LS-C14797 is an unconjugated mouse monoclonal antibody to D4 GDI (ARHGDIB) from human and mouse. Validated for Flow, IHC, IP and WB. Synthetic peptide corresponding to the region of the Fas-induced cleavage site of human D4-GDI. Recognizes cleavage specific human D4-GDI. Species cross-reactivity: mouse. 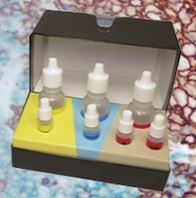 Suitable for use in Western blot., Immunoprecipitation, Flow Cytometry and Immunohistochemistry. Western blot: 2 ug/ml. Immunoprecipitation: 1-2 ug/ml. Flow cytometry: 0.5-1 ug/1x1E6 cells. Immunohistochemistry: 2 ug/ml. Positive control: Fas-treated Jurkat (10 ng/ml).